Packing: 2 sticks per foil pack. 50pcs per box per colour. Also supplied with thick black neck cords. Packing: 25 sticks per pack per colour. 250pcs per box. Packing: 25 sticks per pack per colour. 200pcs per box. Description: Super Long lasting Lightstick - 145 x 10mm. Glows for up to 48 hours, contains special powder mix. Packing: 25 sticks per pack per colour, 200pcs per box. 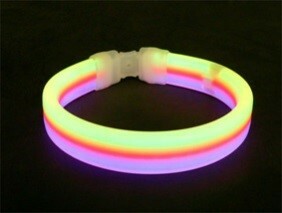 Description: 6 inch thick Glowstix, 15 x 150mm. Also supplied with black neck cords. Colours: Blue, Red, Green and Yellow. Packing: Packed in bags of 25 per colour. 3 colours in one stick as pictured. Packing: Packed in bags of 25. The thickest and brightest of them all. Can also be worn as a choker necklace. The biggest lightstick ever made, looks like a light sabre. Not to be used as a sword. Great for emergency lighting, corporate events or just showing off. Packing: 1 stick per tube. The stick is easily activated if dropped. Packing: 30pcs per tube with special flat connectors. Packing: 50pcs per tube, glow ball connector caps at each end. Packing: 100 bracelets per cylinder. Make 3 bracelets or connect all 3 to make a necklace. Packing: 3 bracelets per pack same colour. 60 packs per box. 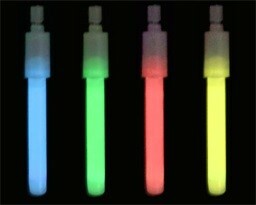 10mm x 300mm lightstick that can be used as a lightstick or a Super Thick Glow Bracelet. Packing: 20 Asstd colour sticks per tube. Colours: Multi colour - Blue, Red Green and Yellow in each pack. Packing: Each in a foil pack, 25packs per bag. Colours: TRI-Colour – 3 colours in the one wristband. 6 x 570mm. Connectors already attached to one end. Packing: 50 Necklaces per cylinder. Description: Glowing Heart Glasses. Heart shape frame glasses with red bracelets that fit inside the frame. 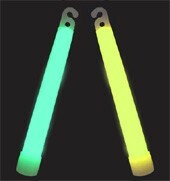 2 x Glow Earrings per pack. 2 x Mini Glowstix attached to bobby Pins per pack. Packing: Each packed in foil pack. 25pcs per bag per colour. A clear plastic straw with a mini lightstick that glides up and down when you take a sip of your drink. Packing: Each packed in bag of 25pcs per colour. 12 Asst colour bracelets and 2 x connectors per pack. A plastic yellow headband with slots to connect 2 or 3 bracelets to form the shape of a bunny rabbit. (Bracelets not included). Description: Glow Body Paint , Fluro Face & Body Paint, Illuminates under Black Light / UV light. Glow liquid mixture; simply pour the 2 chemical mixtures. Together, 50/50 mix to make the liquid glow. Great for special effects or table centrepiece. Packing: 2 x 600ml bottles in foil packs. (1 is the activator the other is the colour) Also comes with a sample measure cup, gloves and spill kit.